Note: This post applies to RS-BA1 version 1.93. In version 1.94 (introduced on 30 aug 2017) the typos are corrected, the drop-down menu at the top is removed and a number of wizards are added to assist with configuration. 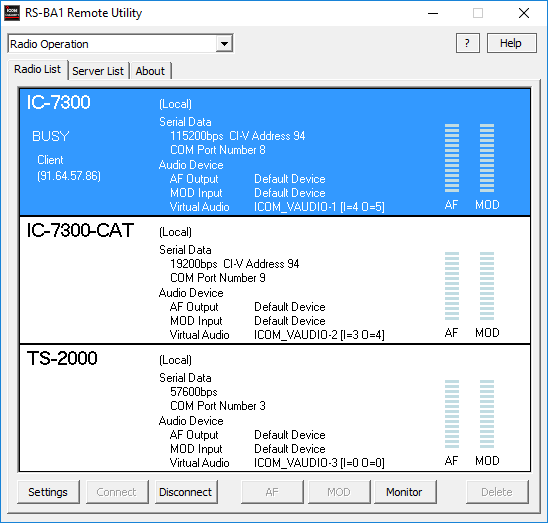 The Icom RS-BA1 software is being discussed a lot. Some claim that it is totally crap. Others happily use it. I’ve tested the software with my IC-7300 and concluded that it works fine. Actually it works so much better than I expected. Even more, I can remote control my TS-2000 with it as well. So why these diverse opinions? My guess is that there is little knowledge on why Icom is doing things a certain way. This is confusing. Also the naming of the various menus (due to translation?) is confusing. Here it helps to understand the software, before configuring it from the documentation or internet sources. With this post I hope to create some more understanding, RS-BA1 deserves it. 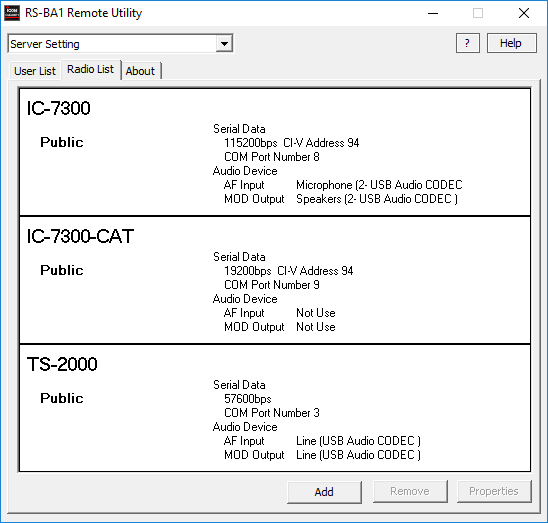 RS-BA1 consists of a program called Remote Utility that implements the client-server communication across the network and a program called Remote Control for controlling your rig from your PC. The first program is actually very generic and as such can be used with other transceivers as well. The second program is Icom specific, but supports multiple Icom transceiver models. Remote Control is multi-user. So settings in the program are your own settings and these are different from the local settings in the rig. Why? Otherwise user A programs memory 1 and this is stored in the rig. Now user B programs memory 1 with some other value. Next time when user A uses the rig, memory 1 has changed unexpectedly. The Remote Control program is actually very smart and handles this for you. But if you assume that this program is just for controlling and programming the rig from your PC, you run into misunderstanding since you cannot program the rig memories with it. 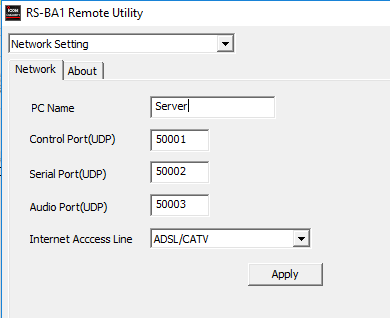 For using a rig remotely, you need to transfer serial port data and stream receive and transmit audio. For this you need a server program that is direct connected to the rig, and a client program from which you control the rig. The client program will create virtual com ports and audio devices so that you can use your application software as if your PC was directly connected to the rig. This is exactly what Remote Utility does. 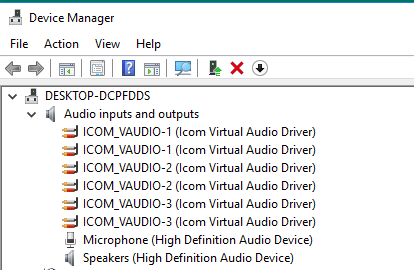 There is no need for a virtual audio cable or virtual com port driver, it’s all included. Note that you can configure a “rig” with only a cat port and no audio (IC-7300-CAT). This is the second (Remote) serial port on the IC-7300 that I wrote about here. The third option in the drop down box is Network Setting. Just name your server and leave the rest untouched. That’s all. The server is active when the program is running. There’s no windows service behind it. When you close the program, the server stops. Do not enter any info in the Server Setting on the client! The Radio List is propagated when you connect to the server for the first time. The client automatically connects to the server the next time when you start the client. The client shows the connection name (DH4FR Remote) and the rigs that you configured on the server. 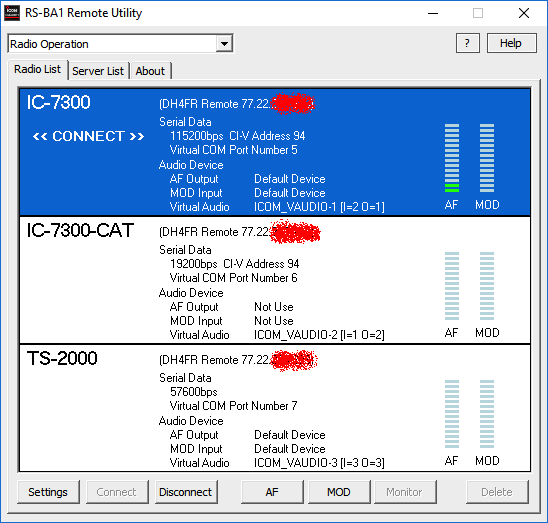 If you connect to multiple servers, the Radio List shows all rigs configured on all connected servers. If a rig is in use, it is listed as busy. For each rig you can configure AF (receive audio) and MOD (transmit audio). 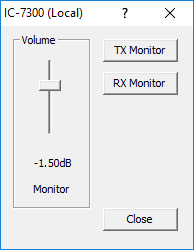 Note that on the MOD screen, you can disable modulation, so make sure to check these settings. With the Monitor button you can listen in on this remote user. Select RX audio, TX audio or both. When configuring each rig on the server, you define the following audio settings: codec type, bit depth, sample rate and number of channels for the receive audio (for rigs with dual receive like TS-2000). These are upper limits for each rig. On the client, for each rig, you have the same selections. Here you can select a lower bit rate when your network connection is slow. Note that these features underline the multi-user, multi-rig, multi-server capabilities of Remote Utility which make it a unique program. But I hope this post so far will help to understand RS-BA1 better. have you ever opersted via the internet using no PC…..just a Silex DS-510 USB server? It is annoying to ha e a PC running for just opdraging the IC-7300…. I’ve never tried such a hardware solution. You can take a look at VirtualHere (http://www.virtualhere.com), it’s a really nice piece of software. The problem however is USB isochronous transfer which a rather tricky. Streaming audio (like with RS-BA1 or Mumble) is easier, especially over the internet with high latency. Having said that, the DS-510 is supposed to do isochronous transfer mode and is relatively cheap. Note that their examples show LAN connections..